2-Rail O Scale Railroading: Twins? Well, not really; not as much as one would hope. Like everything else there's a story connected with this. Back on July 8 I hosted a model railroader at my layout. I had had the brass Sunset Models B&O I-12 caboose on the left for some time, but had not put it out on the layout. So I put on a pair of couplers (quite a task due to poor design) and put it out for the session. With this caboose on the layout the converted 3-rail MTH caboose I had been using now looked very oversize. The MTH is a nicely executed caboose, but too large to be a B&O I-17. So now that I was unhappy with the MTH I had to get better cabooses on the layout. So I pulled out one of the Lionel B&O I-12 cabooses that I have and began the conversion from 3 rail to 2 rail. The caboose on the right is the Lionel B&O I-12 converted to 2-rail. Before I launch into the Lionel's shortcomings let me say this; Lionel is to be applauded for mass-producing this caboose. This is a prototype unique to the B&O and its successor the Chessie System. Only 125 prototypes ever existed. For Lionel to invest in such a limited application model is worthy of support. I have bought 4 of these cabooses and, depending on how I resolve the shortcomings that I will talk about, I may well buy more. What follows is more of a review with an eye towards helping produce better models than a condemnation of a flawed product. Neither the Sunset nor the Lionel is a dead-on-accurate model. The Sunset cost about twice what the Lionel costs, and that needs to be borne in mind. Let's start with simple things like color. Not even the B&O Yahoo group can agree on what paint represents an accurate red for B&O cabooses. But all agree that it's a bright red. On that basis, the Sunset is too dark. 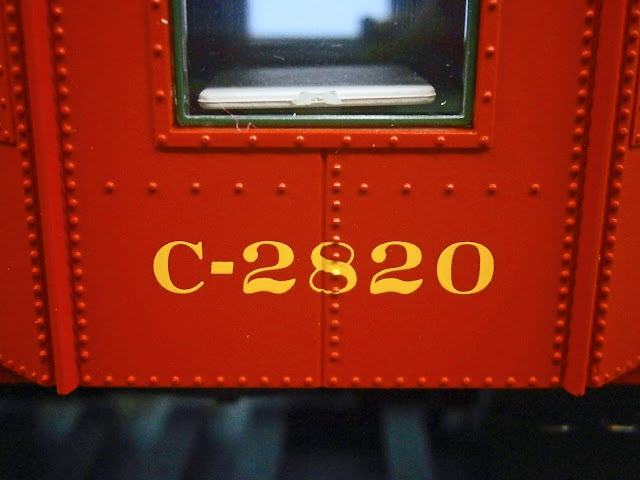 I believe, looking at color photos of the prototype, that the Lionel may be a shade too bright; but the Lionel's color is the better of the two. By the way, the white lettering on the Sunset, which is numbered for a first batch I-12 and Lionel's use of yellow for a second batch I-12 are both correct. This brings me around to a minor beef that I have with all of Lionel's production. Lionel marks all of it's models with the Lionel item number and "Built by Lionel" as seen in the next photo. Lionel does this all of the time. It's unnecessary. Lionel collector's will know that this was "Built by Lionel" It's minor because I can Photoshop this out in pictures, but I should not have to. There's one flaw on the Lionel that could be corrected, but to do so would require stripping the entire paint job and repainting. Running through the center of the bay window on a real I-12 is a lap joint in the side sheet metal accompanied by a line of rivets. The Sunset omits the lap joint entirely, as you can see below. For some inexplicable reason, probably associated with language difficulties, overseas manufacturing or interpretation of drawings, the Lionel has a groove where the lap joint should be. Maybe this was an honest attempt to represent the lap joint, but the groove is the worst aspect of Lionel's model. It could be filled in with putty and sanded, but doing this so close to the line of rivets and having to repaint the model is more bother that I am willing to put up with. I'll have to live with this one. Speaking of rivets, Lionel's are sharp and stand proud of the sides of the model, Sunset's are pressed into the brass and somewhat indistinct. Lionel's are easier to see with old eyes, and at a distance; you'll have to judge for yourself which is preferable. And, no, I don't know what the correct count of rivets should be; but on my next trip to the B&O Railroad Museum... :-). Now for my observations about the Lionel trucks, which are horrid. First, like many 3-rail models, the Lionel sits too high when on it's trucks. Supposedly this is necessary to clear the 3-rail flanges and couplers. However, the Sunset model was also available in a 3-rail version, yet it sits at a more prototypical height. The height will also cause problems with coupler mounting. The complex design of Lionel's truck (or MTH's or Atlas's similar trucks) means that there's nothing that can be done to lower the truck itself, the bolster is too high and the bolster is a complex design in folded sheet metal and I cannot see any way to alter it. On it's high perch, the Lionel caboose looks larger than the Sunset; but it's an illusion, the dimensions of the two bodies are similar. The Lionel truck is a complex design that has a two-part core in addition to the side-frames - with separate bearings and two tiny springs buried in each one. Removing the 3-rail wheel sets and couplers requires full disassembly of the truck after which the lower part of the truck frame, housing the coupler actuation mechanism, serves no purpose. Lionel's wheel sets have 2.5 mm pointed axles, standard O scale pointed axle wheel sets will not fit; and no one makes a 2.5 mm pointed axle 2-rail wheel set. I know that Lionel has no interest in 2-rail conversions, but it appears that they have gone out of their way to prevent 2-rail conversion. I was able to convert a Lionel truck using Precision Scale #203 blunt axle wheel sets which has stepped-down ends of 2 mm. The converted truck rolled more freely than the original, in spite of the blunt end axles. The worst feature of the Lionel truck are two tiny coil springs embedded in each side frame supporting the top part of the frame (I'm hesitant to call it a bolster, because it is more than just a bolster), these springs are not visible from the outside of the truck. 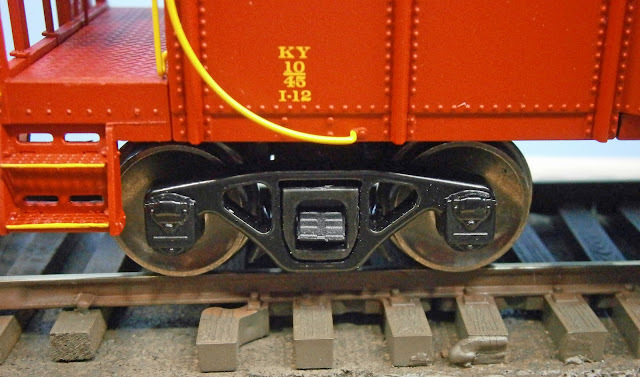 The Lionel truck has a blob of metal representing the caboose leaf springs - very poorly done - and these tiny springs are embedded behind it. In spite of being sprung the truck does not equalize. I believe that these springs are supposed to allow the bolster to move up and down; but they are so firm and have so little travel that I cannot see that they would allow the bolster/frame to move unless the impact was really large. Maybe this is appropriate for the 3-rail market. The issue with these springs is in disassembly and reassembly of the truck. The springs fly out when you remove the side-frames and the you have to try to put them back in place during reassembly. The space where they fit is small and they have to be captured at the top by the bolster while you are juggling wheelsets, side frames and separate bearings (hint - remove the plastic brake shoes to give yourself more space to work with. They are simply press-fit in the side-frames and easy replaced) . The first truck that I converted required 4 hours to get everything together; after working out a procedure, the second still took the better part of two hours. And current pickups still have to be made for the converted trucks. At this point I whimped out and bought MTH 2-rail caboose trucks, which, it turns out, have their own problems in removing the three-rail coupler, also requiring complete disassembly, as well as cutting off the "horn" that's left behind by the 3-rail coupler. But the MTHs do not have the accursed springs and have current pickups built-in. 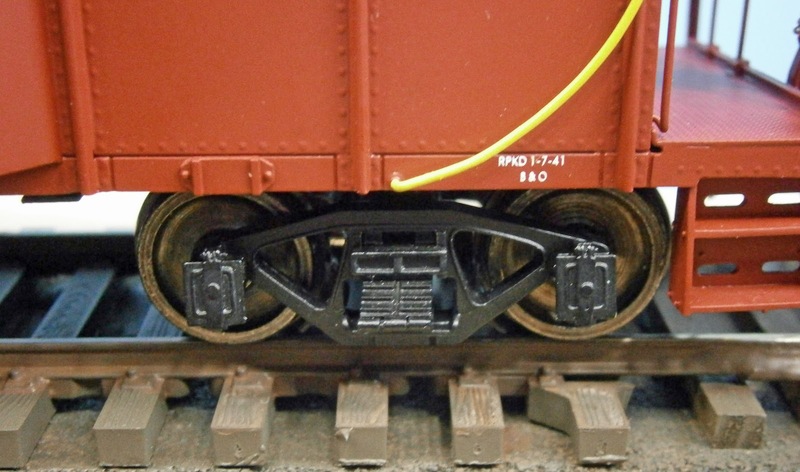 MTH's also have double insulated wheels making the orientation the wheels during reassembly immaterial. Coupler mountings will have to be devised for the Lionel, and these will hang down by at least 0.125 inch because of the high mounting of the body. The end platforms of the Lionel are plastic which will lead to it's own set of problems, especially since I will use these cabooses in actual pusher service; gluing my not be strong enough. Other "features" of the Lionel are just annoyances. The markers are probably oversize, but are painted yellow, which I believe is correct. 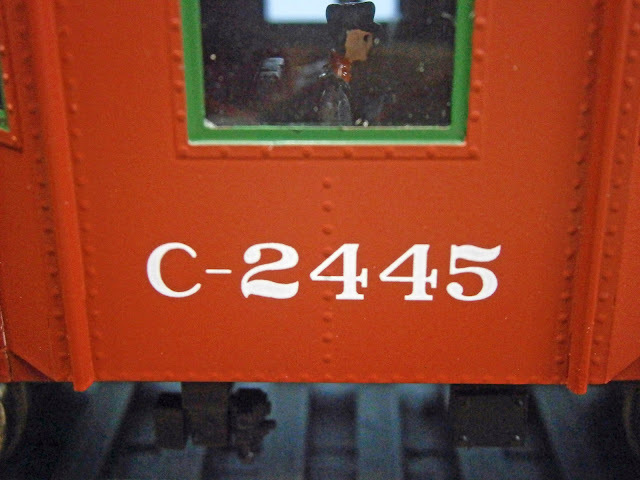 The Lionel window frames seem to be too narrow, when compared to prototype photos; Sunset's are much better in this respect. 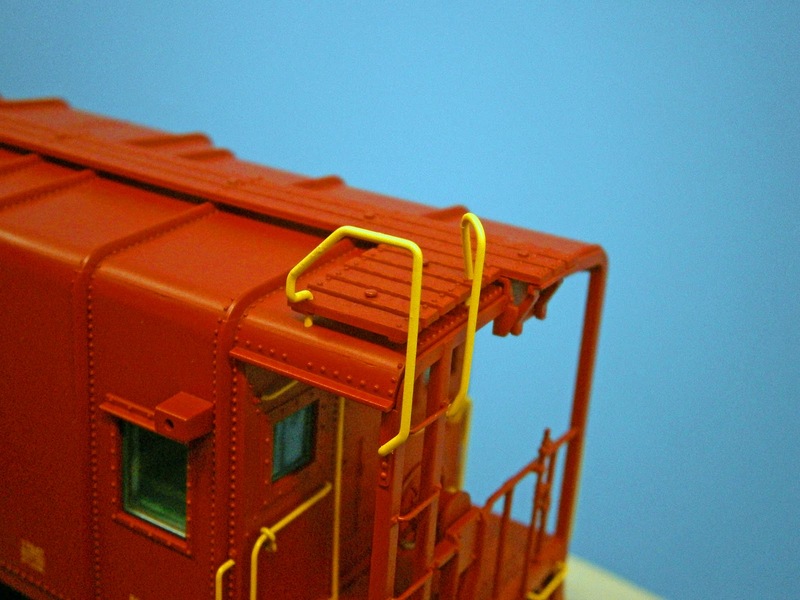 The photo above show the Lionel's handrails to the roof walk. the bottom of the handrail shows a nicely formed attachment point with two simulated bolt heads; but the upper end is simply stuck into a hole drilled through the roof walk into the body. Why do the job half way? 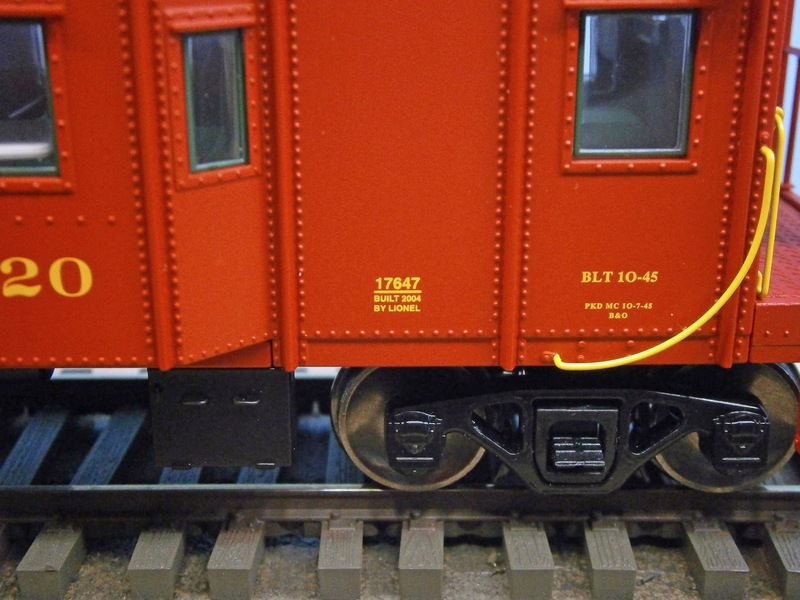 The Lionel has an oversize smoke jack to accommodate the built-in smoke unit. However, they supply a more scale-sized unit that can be substituted; this despite their apparent ambivalence to the scale market. The biggest surprise came in the truck center-to-center spacing. It's axiomatic in the O scale community that 3-rail models need shorter truck center spacing to negotiate tighter curves. This is all the more so if the prototype has the outboard wheel sets tucked behind stairs, as the I-12 does. 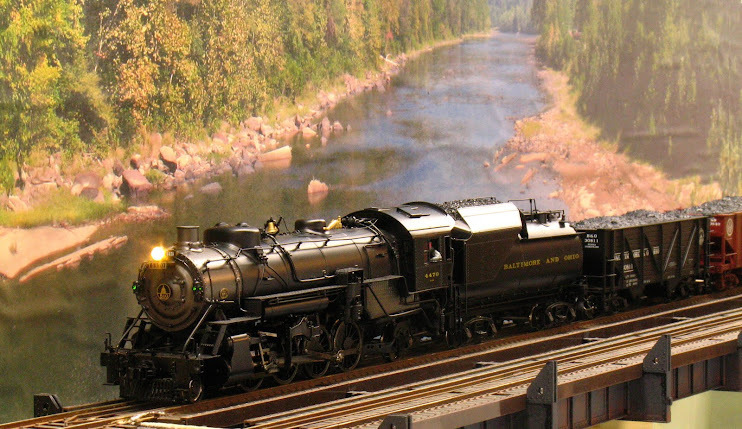 Yet the Lionel has the proper 19 ft. center-to-center spacing and the Sunset does not! The visual effect of this is not great but can be seen in the next two photos. The outboard wheel on the Sunset looks like it could turn 90 degrees and still clear the steps. On the Lionel (sporting the MTH trucks) the wheel is more tucked behind the steps, as seen in the next photo. The Lionel is more prototypically accurate. Lionel also seems to excel in small details like the safety tread on the stairs and well as painting the grab irons and stair edges in yellow, which was B&O standard practice. The Sunset has some grab irons painted body color. So would I buy more Lionel I-12s? That depends. The excess height of the converted caboose rankles me more than I would have thought. It's not the absolute height, but the comparison of heights that will look like hell on a caboose track. The time it takes to make the conversion, even by buying the easier-to-convert MTH trucks is also an issue. I am going to try using the Yorder caboose trucks to solve both the height and conversion time issues, but they come at a cost of $40 per pair. $40 for trucks plus the cost of another Lionel caboose, usually $85-95, is beginning to creep up into the range of used RTR brass, if you can find a good buy. Then there is the issue of availability. Lionel has released about 10 variations of the I-12. The ones that I have are from the first issue, painted for the 1945 build of I-12s and are accurate for the years 1945~1955. These are beginning to command a premium from Lionel collectors; pushing the cost of acquiring and converting any more further into brass territory. Some of the later paint schemes issued by Lionel, like B&O pool service blue, Chessie System and all of the 'fantasy' schemes like the Alaska Road and Polar Express would have to be repainted; a job that I do not relish. So, if the Yorder trucks solve the conversion problems and I can find the proper variations of the Lionel product at a reasonable price then, yes, I will buy more. Also, if I need more I-12s and the brass supply dries up or gets more pricey (currently about $200 for new and $120-150 used) then I will consider more conversions, even if repainting is required.